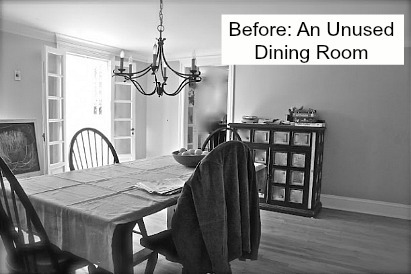 Head over to her blog Classic Style Home for all the details about the makeover. While you’re there, be sure to check out the other rooms that got a new look–including her kitchen. Oh, the beauty of millwork! You can transform, elevate spaces with them! Have a happy day, Julia! Looks great! But I’ve heard that black stair treads are a pain in the rear to keep clean because they attract dust, lint and pet hair! This is striking, but I also have a lot of questions. Mostly, is it me, or did she add a wall separating the dining room from the living room? Does this result in less sunlight? Really just curious. The colors she choose were lovely, and all the white sets in off. They made all kinds of changes to the rooms around the stairs, too. Follow that link I gave you in the post to her blog to see them all! I looked here https://classicstylehome.blogspot.com/2013/05/diy-stair-reveal.html and dont see info on the room behind the stairs. 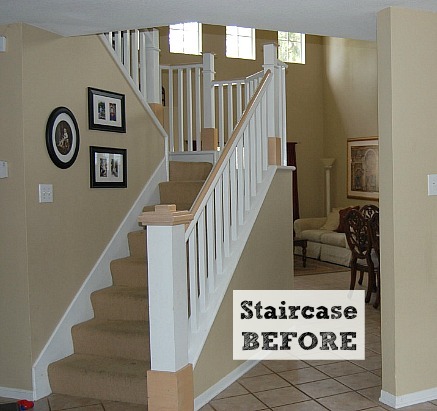 It looks like the room behind the stairs is bigger in the before pic. I guess beige/brown makes rooms seems bigger? All I see is a different paint colour. There are new moldings? 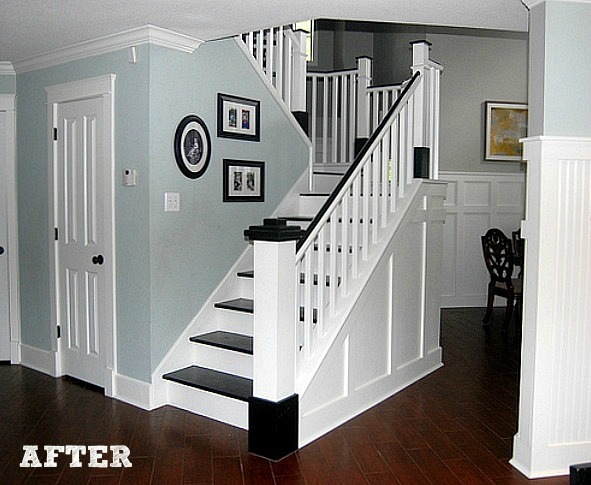 I meant the board and batten-type trim around the staircase. They definitely added a wall in the dining/living area. In the before pics you can see three clerestory windows just behind the upper newel posts. You only see the far left one in the after pic, and the angle is about the same. I used this color scheme in my powder room and love it! Looks great here too. 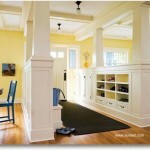 This is just fabulous The paint color, the mouldings – love it all. Personally, I like the idea of making rooms a bit more intimate, without that cavernous height that is supposed to give the illusion of more space (but seldom does). With the blue walls it really pops and looks so fresh…great job! that looks awesome! I love the black. I actually liked it “Before”. The “After” looks too stark and cold-looking in that black and white color. I love the trim, but the colors are a little stark for me. Just a personal preference though. I do love wood stairs and not carpet! I love this makeover…so well done. I do wonder about the dark stair treads. Someone above mentioned that they show everything and I would think this could be a super problem with kids and animals. We recently took the carpet off our stairs and I was worried about the noise factor……my husband and sons tend to sound like a herd of elephants…but it has not been a problem. Our treads were stained a medium oak. Regardless of any changes made beyond the staircase, I judge it a winner. It is just stunning. Well done. Really! !